These radio sounds are caused by beams of electrons–in this case, accelerated by B-class explosions in the sunspot’s magnetic canopy. As the electrons slice through the sun’s atmosphere, they generate a ripple of plasma waves and radio emissions detectable on Earth 93 million miles away. 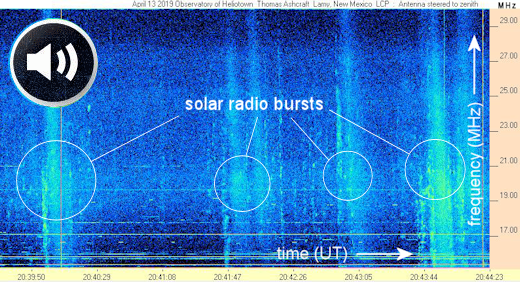 Astronomers classify solar radio bursts into five types; Ashcraft’s recording captured a Type III. Readers, if you would like to detect solar radio bursts in your own backyard, order a radio telescope kit from NASA’s RadioJOVE project. You can have it for $99.95. 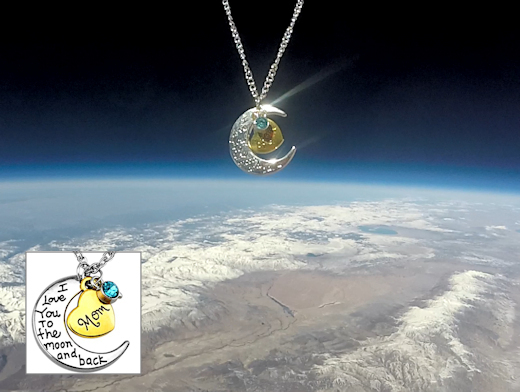 The students are selling these pendants to support their cosmic ray ballooning program. Each one comes with a greeting card showing the item in flight and telling the story of its journey to the edge of space. Sales support the Earth to Sky Calculus cosmic ray ballooning program and hands-on STEM research.